China’s first indigenously developed fifth-generation fighter jet had its international debut at this year’s Dubai Air Show, China Military Online reports. According to the website, this was the first time that the FC-31 “Gyrfalcon” (aka J-31) was exhibited overseas. 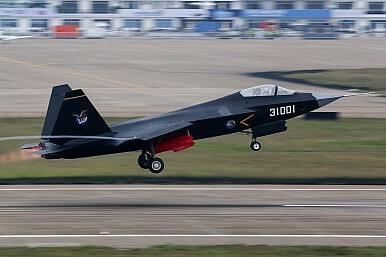 At the air show the Aviation Industry Corporation of China (AVIC) is trying to pitch the FC-31 as an alternative to Lockheed Martin’s F-35 Joint Strike Fighter, however, with limited success so far. As of now, only the People’s Liberation Army Air Force (PLAAF) has expressed interest and is “in negotiations” with AVIC to buy the aircraft, according to an AVIC project manager. Other potential customers include Iran and Pakistan. AVIC representatives at the air show praised the aircraft’s “outstanding situational awareness” and emphasized that the FC-31 is designed for “the demands of future battlefield environments,” Defense News reports. The aircraft design is believed to have been stolen from the American-made F-35 in April 2009 when Chinese hackers breached the networks of U.S. defense contractor Lockheed-Martin and obtained access to the blueprints of the plane. Indeed, the FC-31s airframe resembles that of the F-35. Like the F-35, the FC-31 also has two internal weapons bays that can carry guided and unguided weapons. Overall, the aircraft allegedly can carry 3.600 kilograms of payload–910 kilograms internally and 2,700 kilograms externally under its wings. Other similarities are more subtle. For example, the FC-31s electro-optical targeting system, dubbed EOTS-89, resembles that of the F-35. “The similarity includes the use of two tracking mirrors and a flat-facetted optical window, with bottom fuselage placement just aft the radar radome,” according to IHS Jane’s Defence Weekly. However, most aircraft experts believe that China’s stealth aircraft, billed as a fifth-generation fighter, cannot compete with the American fighter jet, although any unclassified assessment of the aircraft’s performance is highly speculative at this stage given the sparsity of information publicly available. The prototype of the twin-engine aircraft is equipped with the Russian Klimov 8.29-ton thrust RD-33 turbofan. Some reports indicate that China is working on developing an improved version of the WS-13 Taishan turbofan, itself a derivative of the Russian-made Klimov RD-33 turbofan. A prototype of the FC-31 first flew in October 2012. The aircraft’s first public flight demonstration occurred during the Zhuhai Air Show in China last year. The first flight of the production aircraft is slated for 2019. AVIC plans an initial operational capability by 2022. The stealth fighter jet is supposed to reach full operational capability in 2024. Is China Rethinking the Shenyang J-31 Fighter? The Chinese military has been lukewarm about the J-31, concerned that its performance did not merit domestic acquisition.